Mint Jelly was served on the side of Roast Leg of Lamb  at the Glen-Mor Restaurant. We are serving lamb this weekend and having never made mint jelly before, I decided to start early with this necessary accompaniment in case I needed multiple attempts. Surprisingly the jelly came out perfect on the first try. 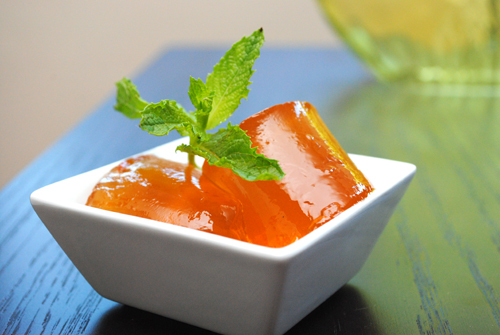 Homemade mint jelly is not green unless food coloring is added (I don’t stock food coloring). This version does not can the jelly for storing in the pantry, and instead makes jelly that can be refrigerated for up to 3 weeks. If you prefer canning and long-term storage, use the same ingredients, but boil mixture inside cans during the boiling step, as would be done in any fruit jelly preparation. Roughly chop mint leaves and stems after measuring 1-3/4 cups. Place mint in a small stock pot over medium heat and add boiling water. Bring mixture to a boil, then cover and remove from heat. Let steep for 10 minutes. Pour mint leaves and juice through a fine sieve, discard solids and retain liquid. Measure 2-1/3 cups mint juice and pour into a medium saucepan. Discard remaining juice or set aside for another use, such as adding to iced tea or other drinks. Heat mint juice over medium heat and add granulated and brown sugars. Stir to prevent the sugar from sticking to the bottom of the pan, and allow the sugar to dissolve in the liquid. Juice one lemon and add the lemon juice to the mint and sugar mixture, this should yield approximately 2 Tbsp. of lemon juice. Bring mint juice to a boil over medium-high heat. Once boiling, add the pectin and stir to incorporate. Continue boiling for 8 to 10 minutes, or until mixture reaches 220 degrees-F. While mixture is boiling, place a small plate in the freezer to chill. Once the mixture reads 220 degrees-F, spoon out a small amount and place on the chilled plate. Let cool for 1 minute, then push the jelly with a finger to see if the jelly remains fluid or if it has started to solidify. If the surface of the jelly wrinkles when pushed, the mixture is done. If not, continue boiling another few minutes and try again. Pour hot mixture into a glass storage container. Leave on the counter uncovered for 30 minutes to cool. Cover and store in the refrigerator until ready to serve. Serve at room temperature along with Roast Leg of Lamb . Jelly will keep in the refrigerator for up to 3 weeks.